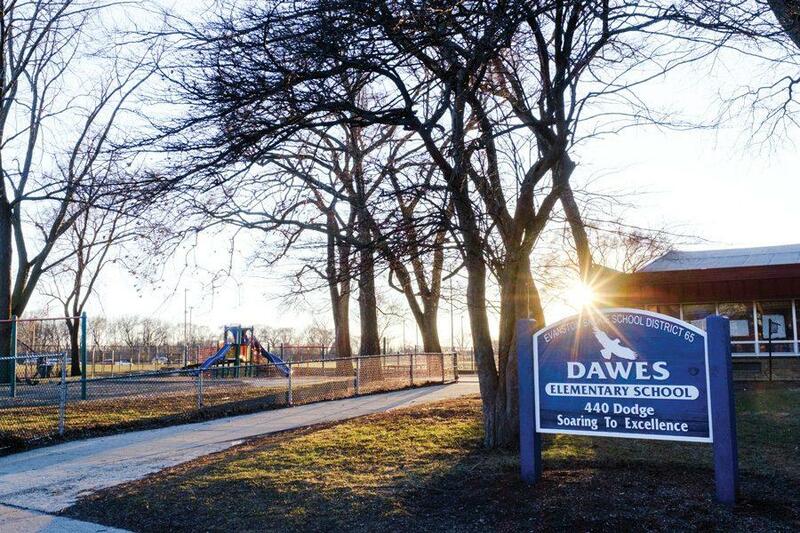 Dawes Elementary, 440 Dodge Avenue, is one of ten elementary schools in Evanston/Skokie School District 65. A report released last month showed some progress, but consistent racial disparities, in the district. A report released by Evanston/Skokie School District 65 last month cited overall progress in academic performance but persistent racial disparities in student achievement. The “achievement and accountability” report analyzed student achievement in the 2015-16 school year, which marked the first year of implementation of District 65’s five-year Strategic Plan. The plan emphasizes a focus on high quality teaching and learning, financial sustainability and family and community engagement. The report highlighted that more District 65 students are meeting annual academic growth targets. In just two years, the percentage of students whose academic progress meets or exceeds national averages is up 8 percent in math and 9 percent in reading, the report said. District 65 Superintendent Paul Goren said students making expected gains signals that what the district is doing is bringing some success. He said he believes tests give the district a transparent measure of how well students are doing, as well as what specific areas the district can look at to make improvements. The report assesses achievement of students across five racial groups. According to the report, the district “has more work to do” to promote equity, citing a goal to increase the percentage of all student subgroups in meeting college readiness benchmarks. Over the past year, only black and white students made increases in reading, and none of the five groups made increases in math, according to the report. To eliminate the achievement gap, Goren said the district is making a very intentional effort to teach students to read at a young age. The literacy curriculum focuses on teaching specific fundamental reading skills such as letter recognition, reading comprehension and “phonemic awareness,” he said. “That work goes on in classrooms day in and day out for an extended period of time for all kids,” Goren said. Cicely Fleming, president of the Organization for Positive Action and Leadership, said the district needs to implement a racial equity policy to increase opportunity for students of color. According to the report, there is a 56 percent disparity between black and white student subgroups meeting college readiness benchmarks. “If you look at the district’s test scores and suspension rates and everything else, the African American community bears the heavy burden of that,” Fleming said. Fleming said she has been pushing for District 65 to adopt a racial equity policy since last spring. The district’s board is in the process of drafting such a policy, Goren said at a school board meeting Monday. Peter Godard, chief officer of research, accountability and data for District 65, said the district worked with the Institute for Policy Research at Northwestern to help expand the measures being used to track student progress. He said the current means of evaluating student performance are mainly limited to testing. “In order to get a full and robust picture of all of the many assets and challenges that our students bring and that our schools have, we very much would prefer to have a multiple measures-based system,” Godard said. The district will face a critical step in determining its financial future with a property tax referendum that will be on the April municipal ballot. The referendum would raise property taxes by about $450 for an average Evanston property owner and would help the district combat a projected $114.4 million deficit by fiscal year 2025. If the referendum doesn’t pass, district officials have said the district’s only other option would be significant budget cuts that would likely result in school closings and substantial increases in class sizes. Goren said although the potential lack of resources would present challenges to the board, the district would remain committed to improving student achievement.